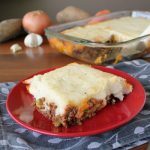 This Shepherd’s Pie casserole has hearty layers of deliciously seasoned beef, veggies, and creamy parmesan mashed potatoes. Make as a prep-ahead freezer meal to speed up midweek dinnertime preparations. 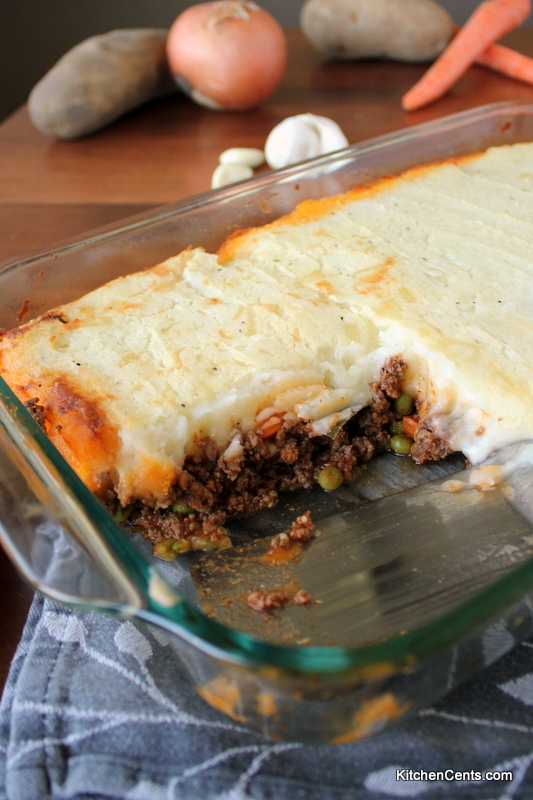 This Shepherd’s Pie is so delicious! 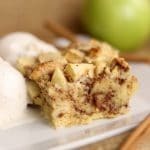 It’s a yummy comfort classic that is perfect for the busy cook. 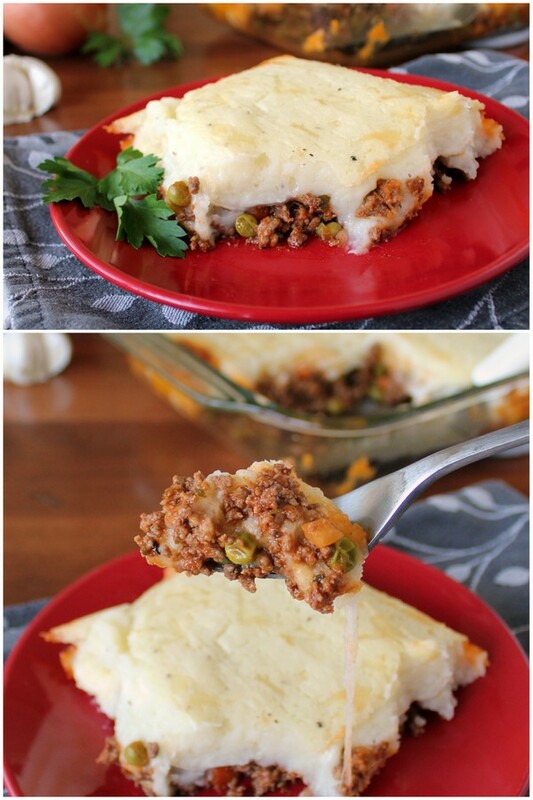 Make it into a prep-ahead freezer meal and have this tasty shepherd’s pie hot and ready in 30 minutes. Prep-ahead freezer meals are made with raw ingredients or mostly raw ingredients and will require the last steps (mix together/cook) to still be completed. This method gives a cook the ability to cut down prep time by making ahead but still allows for a freshly cooked meal. A traditional freezer meal is usually made (mixed up completely0, sometimes even cooked before freezing to allow the cook to simply reheat the frozen meal. 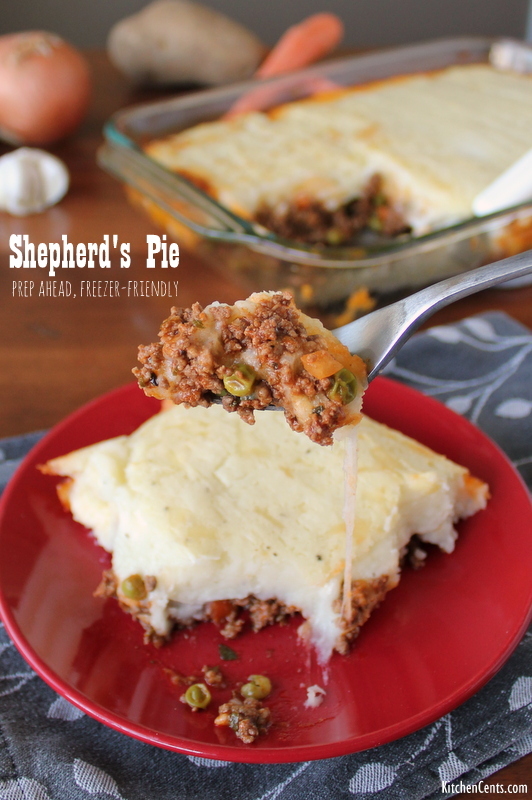 This Sheperd’s Pie can be made either way but we prefer the prep-ahead freezer meal version. This allows me to cut my prep time to a quarter of the time and still have a FRESHLY made hot meal. It’s that what we all want? A hot, fresh delicious meal that saves us time and money!!! If you agree, this Sheperd’s Pie is for you! Can this Shepherd’s Pie Casserole be made ahead? YES!!! I’m all about saving time and money. I love to prep a few batches (2-3 every couple months). This method of preparation saves me time and money because it’s easier to make a few of the same meals at the same time to save time later. Having premeasured ingredients can save loads of time later. This makes those crazy, busy evening easier to get a hot, FRESH meal on the table because all you have to do is assemble. This shepherd’s pie only takes 30 minutes to assemble and bake when using premeasured, ready-to-go ingredients. Making several of the same meal ahead can also be more cost-effective. Most ingredients come in larger containers than you need for one meal. Buying products, especially meat, in bulk can save you a lot of dough too. Can this meal be frozen for later use? Yes. I like to prep the ingredients (raw) then freeze them for convenient and quick assembly. This way, I thaw the ingredients, mix as directed, bake. I still get a hot, fresh meal that hasn’t been previously cooked. You could make it in its entirety and freeze it, then you’d only have to reheat from frozen but I still prefer the prep-ahead frozen. The meal comes out freshly cooked rather than precooked and reheated. I think fresher is better (within reason) 😉 . How long does it take to prep? It takes me about 45 minutes to prep, cut, measure, etc all the ingredients for 3 meals. That includes making the mashed potatoes. If I only make one batch, it takes me about 35 minutes to prep. I love when I can prep 2 additional Shepherd’s Pie meals for only 10 extra minutes of work. Sometimes, I cook one batch for dinner that night and freeze the other two for when life gets crazy. This is what my freezer pack looks like when it’s ready for the freezer. Note: I found 2-gallon size ziplock bags at our local Dollar Tree store. You also want to make sure all the air is pushed out of each bag. This helps preserve freshness. These meals are also great as a gift to friends, family or neighbors in need of a meal. They can cook it that day or save it for when they really need it. I love giving one of these meals to friends or family that are having a baby because they usually get bombarded with food the first couple weeks then have nothing after that. 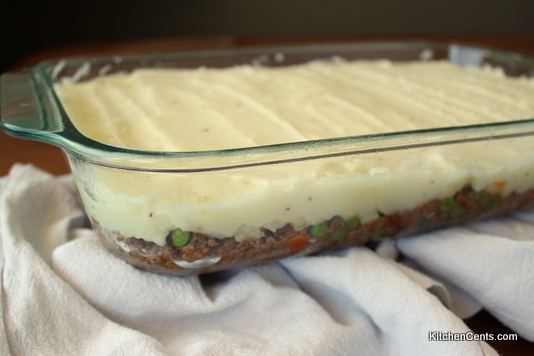 How long does this Shepherd’s Pie take to assemble from frozen? I like to put my prep-ahead freezer meal into the fridge to start thawing a day or two before using. 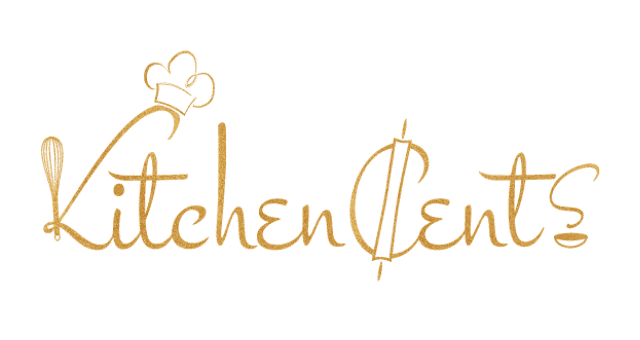 If all fresh ingredients are used, it can stay in the fridge for 3-5 days thawed. I use my Instant Pot saute setting to cook the ingredients before going into the oven. 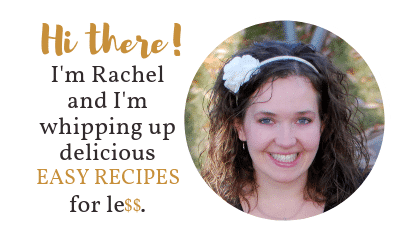 If you don’t have an Instant Pot (you have to check them out! They are AMAZING!) you can use a pot on the stove. It takes about 10 minutes to cook the meat and veggies. Once the meat-veggie mixture is done, I pour it into my baking dish, smooth it out evenly then move onto the potatoes. To heat the potatoes, I use the same instant pot. I usually don’t even bother to clean it out from the meat-veggie mixture. It takes about 5 minutes on low saute to heat through. Once the potatoes are hot, I turn off the heat and add the cheese mixture. I smooth the creamy, cheesy mashed potatoes over the meat-veggie mixture. Pop the filled baking dish into the oven for about 15 minutes to allow the meal to get hot and bubbly and dinner is on its way. All in all, it takes me about 15 minutes or so to assemble this shepherd’s pie when I’m making it from a pre-measured pack. After 15 minutes or so in the oven, it comes out hot and bubbly. You can’t beat having a hot meal like this ready in 30 minutes when, traditionally, it would take well over an hour to make. I LOVE hot and ready meals that can be made 30 minutes! Have you ever made a prep-ahead freezer meal or regular freezer meal? Which do you prefer? 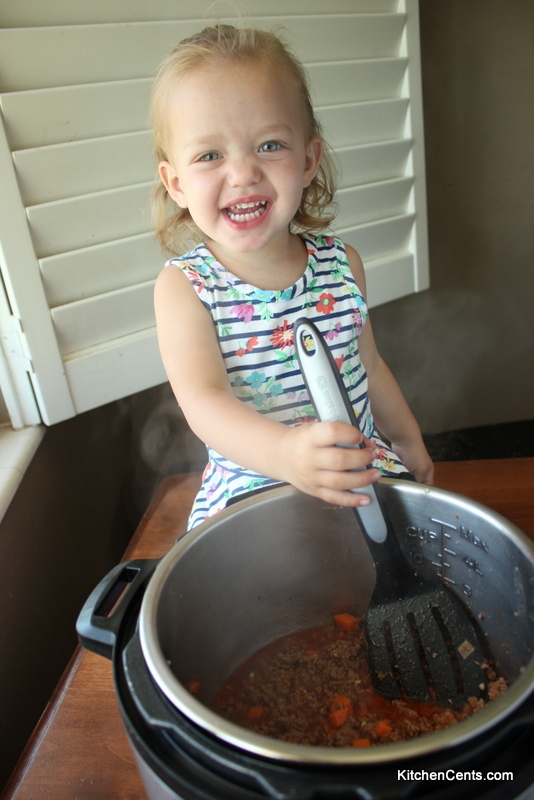 What other recipes have you found that are great as a prep-ahead freezer or regular freezer meals? This Shepherd's Pie casserole has hearty layers of seasoned beef, veggies, and creamy parmesan mashed potatoes. Prep-ahead, freezer-friendly, delicious! Peel and cube potatoes. Place in pot with enough water to just cover potatoes. Boil potatoes until fork tender. Drain all water. Add milk, butter, 1 tsp. salt and 1/4 tsp pepper. Mash potatoes until smooth and creamy. Add additional milk to thin if needed. Add additional salt and pepper to taste. 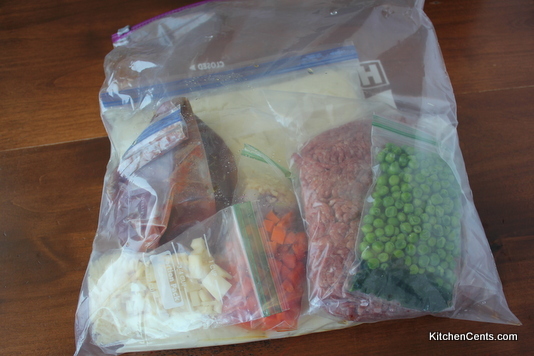 Cool and place in gallon size bag if making for a prep-ahead freezer meal. Place carrots, garlic, and onions in small zip lock bag. Place water, bay leaves, beef base, Italian seasoning, rosemary, and tomato paste in QUART size zip lock bag. Squoosh to mix. Place swiss and parmesan cheese in small bag. Place ground beef in another zip lock bag. 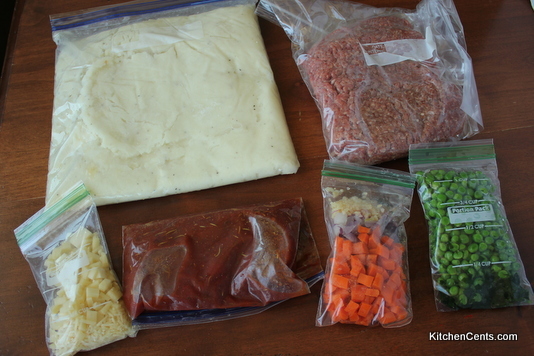 In large (2-gallon bag or grocery bag) place bagged carrot mixture, bagged tomato sauce mixture, bagged cheese mixture, bagged ground beef, bagged mashed potatoes. Make sure extra air is pushed out of each bag. This helps preserve freshness. Place printed recipe card inside bag so instructions are included. Label bag or recipe card with date meal was prepped. Can freeze for 2-3 months. 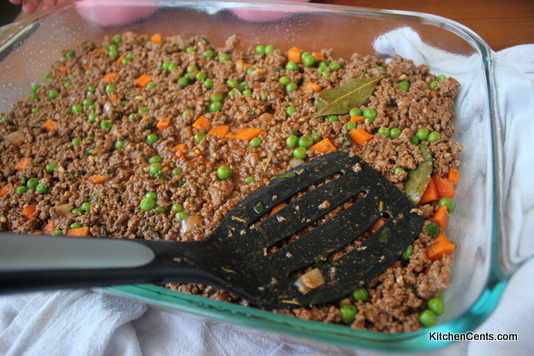 In Instant Pot or on stovetop, brown ground beef. 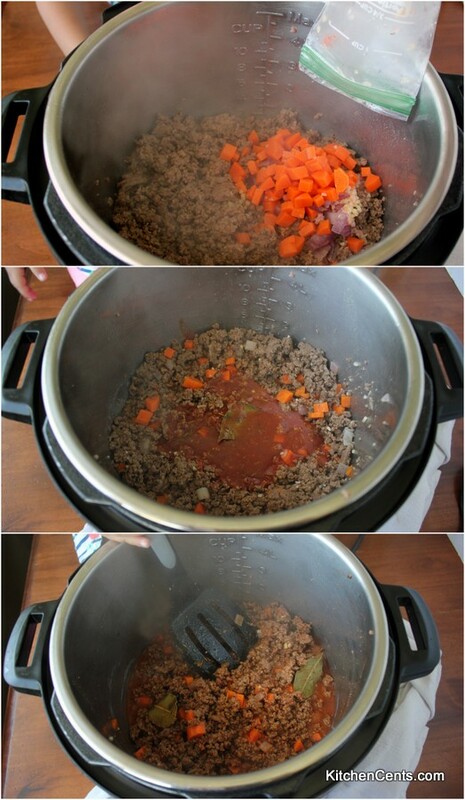 If using 90/10 ground beef or fattier, drain liquid. Add carrot mixture. Cook for 2-3 minutes. Add tomato sauce mixture and simmer until liquid is almost gone (about 5 minutes). Remove or turn off heat and stir in pea mixture. Pour meat mixture into 9x13 baking dish sprayed with nonstick cooking spray. Press down and smooth until even. Place mashed potatoes in Instant Pot or pan over medium heat. Stir frequently to avoid sticking. Heated until smooth. 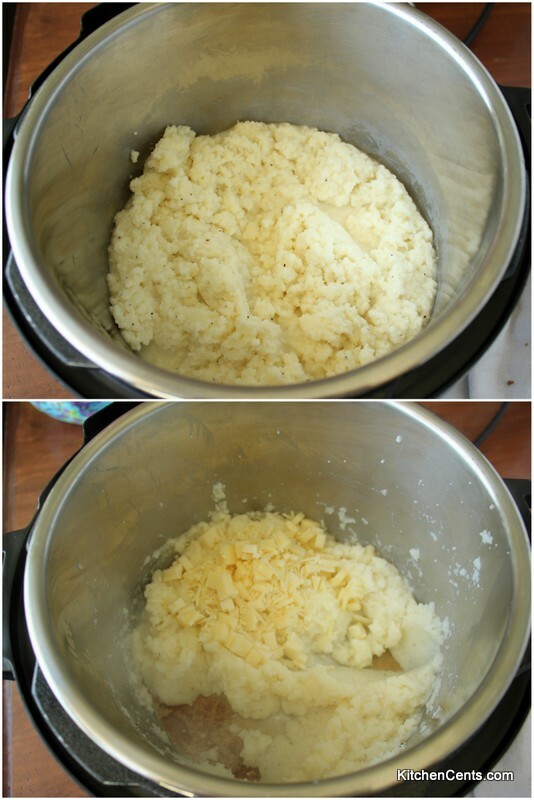 Remove or turn off heat and stir in cheese Mixture. 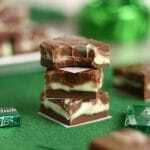 Top meat layer with mashed potato mixture. Bake uncovered at 400°F for 15-20 minutes, or until golden and bubbly. 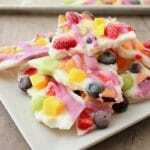 You can halve this recipe and fit it in an 8x8 inch baking dish. 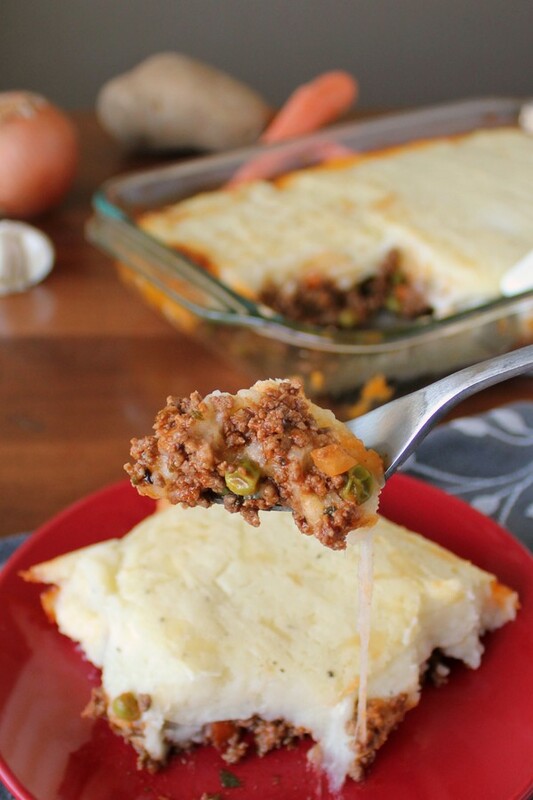 **Recipe inspired by Dream Dinners Cattleman’s Pie.